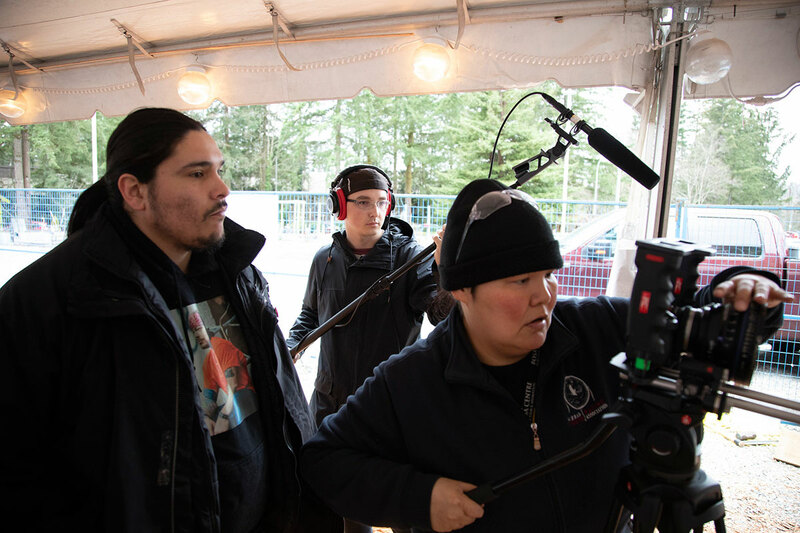 “I was extremely excited about having the chance to witness the birth of a canoe and I wanted to be part of bringing it to light in whatever way I could,” says McArthur, a graduate of the Indigenous Independent Digital Film Diploma program who is now enrolled in the Motion Picture Arts Degree Program. 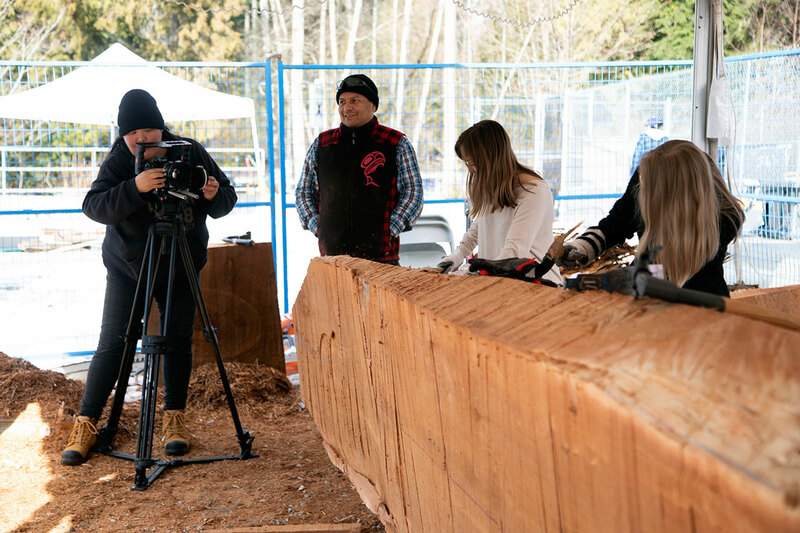 McArthur’s infectious enthusiasm to document the carving, including the protocols around drawing out the canoe’s spirit, spread to her fellow classmates. In no time, she and four others formed a creative team to film the process. Each team member brings their unique talents and perspectives to the filming. The team includes Michael Wright of the Gitsxa-wetsuwet’en Nation, Esteban Manuel from the Secwepemc (Shuswap) and Ktunaxa (Kootenay) from Neskonlith, Dustin McGladery from the Nisga’a Nation (specifically the Gisk’ansnaat Tribe at the Gitlaxt’aamiks Village), and John Spink of the Metis Nation, who has roots in Alberta, Montreal, Montana and Oklahoma. The canoe, an enduring symbol of the imagination, identity and skills of First Nations people, has deep meaning for Saskatchewan-born McArthur, who is of Nakota-Plains Cree heritage and grew up on White Bear First Nation. She sees the canoe as a metaphor for life. To date, the students have recorded about 12 hours of footage, which will be edited into a 10-minute documentary that will screen at the University later this spring. 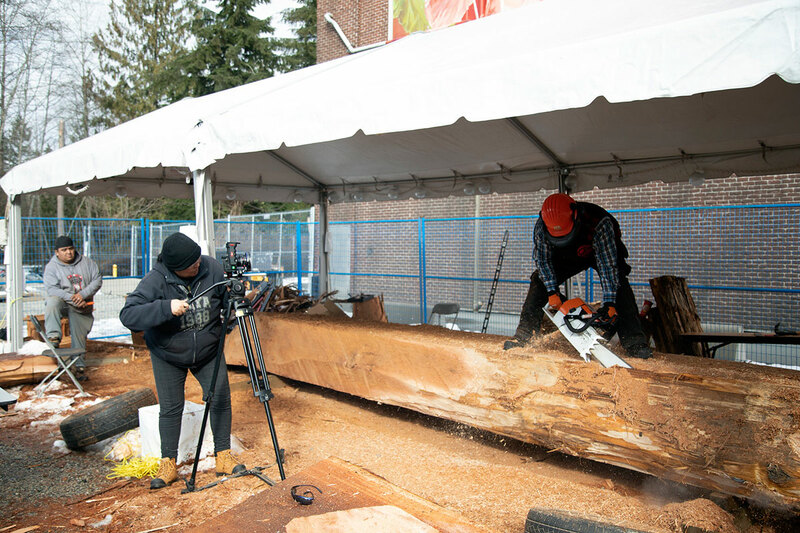 Even before master carver Ses Siyam (Ray Natraoro) put a chainsaw to the log, collaborating with the Squamish Nation artist has been a privilege and positive experience for the documentary team. An awakening and a naming ceremony will be held on April 11, 2019. Then the canoe will eventually make its way onto the water. Future plans include potentially forming a campus paddling team, not just for athletics but to share important Coast Salish cultural traditions.